He is born one month early, a bit underweight. His eyes are wide open, his apgar score an 8. A content precious infant, sleeping away. Cries only heard when he needs us, smiles and giggles most every day. Belly is filled with oodles of love, legs try to bounce and hop. Curiosity takes over his hungry mind, questions bombarding non stop. Wants to be just like his daddy, but adores his mom just the same. School is a new adventure as he starts to “play the game”. Bathroom words are hilarious, he can’t stop reciting them at bay. As parents we try to be serious but laugh because, what can we say? Balls, swords and bikes are a plenty, as he figures it out on his own. Soon the pimples start showing and maybe even a broken bone. Deodorant is a blessing in a house that is quite small, dirty socks on the table, underwear in the hall. Car keys go missing and worries increase, he prefers his friends now and tries hard to please. Twelve years of school soon come to an end. Who is this young boy graduating, wasn’t he just ten? The time has now come, to leave the cozy nest. College is upon him and all of the rest. He leaves apprehensive, anticipation is high. He loves his family but it is time to say goodbye. His parents and sister mourn his sweet presence, dinners are quieter, dirty socks missing. He appreciates his family and becomes their biggest fan. He leaves as a teen and comes home a young man. That’s so beautiful!!! Kids grow up so fast!!! I noticed that with my nephew this Thanksgiving!!!! Awww. You must be sooo proud of him. He’s a fine young man. Love love love the Christmasy theme. Aww, what a wonderful poem!! I am sure my mama feels the same way about me..except…I haven’t left yet. HAHA! You look gorgeous and your son looks so handsome and obviously happy to be in his momma’s arms. 🙂 I hope you had a wonderful holiday! Awwww…. I’m totally jealous that he has a mom who writes such kind, thoughtful, and witty poems about him. It must have been great having him home this week! You are right, Guat! The words just came to me with ease because I meant every word. Gosh I’m getting so sappy since I turned 50! Aw wow, that’s really lovely, and such good looking people too! I’m in tears. Of course he loves his mom. Three weeks and we meet up with my babies. It’s just so amazing watching them grow! I bet you miss your babies, it’s been quite a while for you! I’m sure they will be happy to see you both! Beautiful post. Really portrays just how fast time really does fly! What a handsome young man! This is beautiful, Maria! 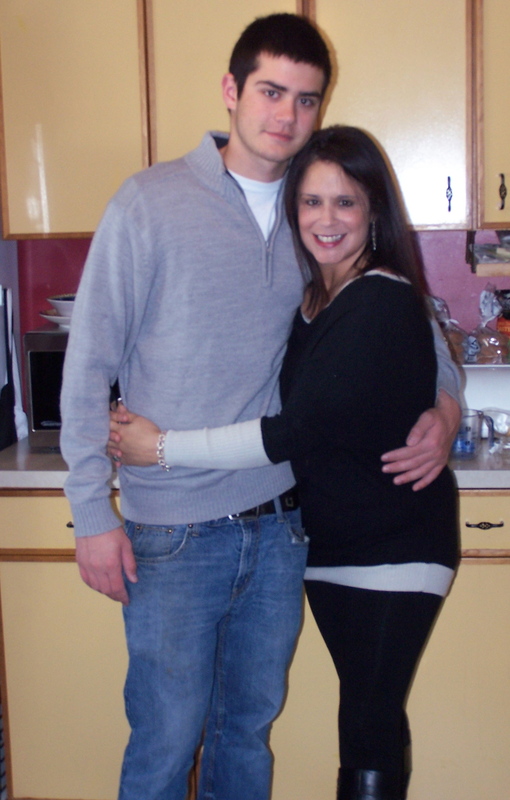 There’s nothing better than a young man who loves his momma…great photo! I hope you had a great Thanksgiving!